Since Virginia is firmly rooted in the South, there are plenty of critters that make their way into our homes and linger. Unfortunately, that often means you’ll have to invest in regular exterminators and a whole slew of bug spray when you live in certain areas. But the lovely South can never be replaced so we endure it until we’re planning to move to a new area. Pests are the kind of thing that you don’t want to take with you if you don’t have to. What if you arrive at your new home in Chesapeake and find it’s bug-free! You won’t want to introduce your bugs from your old place into this clean haven. So how should you go about packing and storing your items so you won’t have to bring more than just you and your family to your new home? We’ll let you in on our professional secrets to save you the trouble of carrying extra passengers around with you. While cardboard boxes are cheap and recyclable, plastic bins are far better because the lids seal and the corners can’t be squeezed through. Cardboard boxes can be breached by every kind of vermin. It’ll be just like when a fly gets in the house and it can’t figure out how to get out, once those passengers have joined the rest of your things in that box, they won’t evacuate the area until you unpack the box. In fact, we like to caution against folks going and grabbing boxes from their local supermarket because you never know what’s lurking in those boxes and what you’ll be bringing into your new home with them. Stick with plastic bins and their sealed tops that will keep your possession safe from grubby, insect paws. When packing, it’s also a good idea to check your linens and sheets, especially the ones you’ve been keeping in the linen closet for months. Moths and bed bugs tend to linger in these items but their presence can be spotted when you identify damage in the linens. If you can identify the problem, you’re already ahead of it. You wouldn’t think it, but even appliances and electronics are at risk of falling prey to bug infestation. Coffee pots and alarms are all tiny appliances that have gaps beneath that hard plastic casing where bugs can easily stick around. You won’t be able to treat the product, so it’s best just to throw them out and invest another $10 to get a new one. If you’re set on them accompanying you, inspect them and then lock them in a large ziplock. You’ll be able to see if any bugs come out once you start unpacking in the new place and then you can address the situation however you wish. Make sure that before you pack everything up, you give it a good wash and an excellent dry. Pack them immediately after drying them and then turn your eye to the older food. If it’s an open package, just cut your losses and toss it. Any food items that look suspicious should not follow you to your new home. If you’re concerned about the food items that you have, stick them in the freezer as those conditions will generally kill anything. If you’re interested in scheduling a move from Chesapeake feel free to reach out to us. 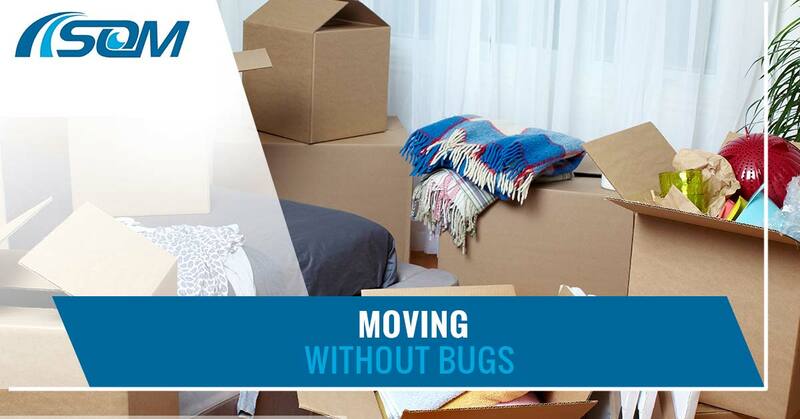 We’d be glad to help the latter part of your move remain bug-free as we transport all possessions with extreme care. Schedule your move today.